A musical keyboard stand is an important part of any musician’s arsenal. Without a quality stand, any number of unfortunate events ruin your enjoyment of the music. 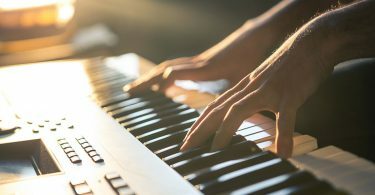 If you’re a professional musician, you likely know firsthand the hazards involved in performing outdoors – if you don’t have a stand that effectively blocks the wind and secures your equipment. For the amateur, you’ll want a stand that is strong enough and durable enough to adequately hold the keyboard while still providing plenty of room to move around the keyboard. For musician’s who are more tech savvy, a good music stand can help you to prevent damage to your tablet when playing music you’ve downloaded. It’s also crucial to have a music stand that collapses so that you can take the stand with you to performances. By making a sound decision during the purchase phase, you’ll ensure that your stand meets your needs for years. The Knox Z meets all our criteria. It can stand up to the most lively performance and will serve you well for years. I’m a music professor at a major tier I research institution, and I’ve been teaching and performing for more than two decades. 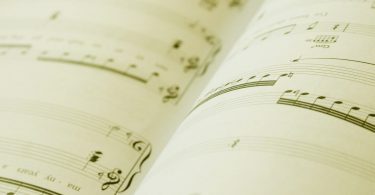 I’ve written this article as a service to my students since a good music stand can quite literally make or break you. My experiences over the years have made it possible for me to spot a poor music stand immediately, and I want to make sure you don’t end up with a stand that won’t fit your needs. If you buy a quality stand from the outset, you won’t have to worry about purchasing another stand in the near future. Spend the money now on a high-quality stand and you’ll end up saving money on replacements for cheaper, inferior quality stands. Don’t let a few dollars stand in the way of your enjoyment of music. Spend the money now and you’ll be grateful you did. 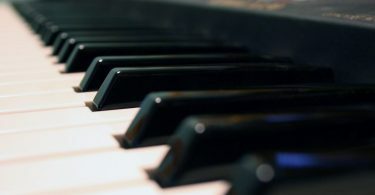 Before you consider any music stand, you first need to know what kind of keyboard you have. If you have one of the Yamaha keyboards that require a special stand, you’ll need to purchase the stand that comes straight from the manufacturer for the best results. Fit – You’ll know if you need a custom stand from the manufacturer because your keyboard won’t lay flat when you place it on a table. The keyboard will wobble without the proper stand. Provided you have a universal-style keyboard, you can use any keyboard stand. 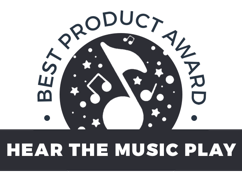 Design – You’ll notice there are a few different varieties of music stands available on the market. Stands you typically want to avoid tend to have a single bar that crosses in an X-formation. These stands aren’t reliable, they tend to collapse more easily and they often break or bend under heavy usage. A music stand should be portable, but it also needs to be heavy enough to prevent accidental tipping. The number of keyboards that I’ve seen get accidentally knocked over in the middle of a set or after a concert runs a tally higher than you might expect. Look for a stand that is made of heavy-duty metal. It’s also important to find a stand that is highly adjustable so you can use the stand with multiple keyboards. 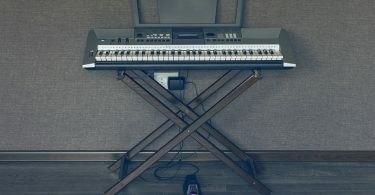 Pedal – One aspect of a good keyboard stand that often goes overlooked is whether the stand makes room for the use of a pedal. The stands that have a cross in the center tend to get in the way of effective pedaling technique. Choose a stand that looks more like a table to avoid this complication. The pedal may not be something you use often, but a pedal can do much more than simply sustain notes. A pedal can make it easier to use sampling programs and create realistic demos for auditioning purposes. This is especially important if you’re a composer since you’ll need to be able to use a pedal with most sequencing programs. Straps – Keyboard straps are also important. If you purchase an expensive keyboard, you need to make certain that your music stand will support your keyboard and keep it stable. Straps are available with better-made keyboard stands to ensure that the keyboard doesn’t accidentally get knocked off the stand. Some people believe that straps just get in the way, but when used correctly they can protect your equipment. All it takes is someone bumping into your keyboard to knock it off the stand. If you have a heavy stand and your keyboard is strapped in, you’re better able to survive such an onslaught. Feet – Finally, the keyboard should contain rubber ends or feet. Some of the cheaper stands don’t have rubber grommets on the feet, and this can make the keyboard vulnerable to sliding and moving around. Rubber padding on the feet will also ensure that your floor doesn’t suffer damage if you routinely move your keyboard around your house. If you’re still not convinced of the importance of a good stand, look at the lengths this performer takes to fix his faulty keyboard stand. The Knox Z is the keyboard stand I would recommend to any musician. It’s a good solid stand that will serve you well for years. It meets all of the criteria of a good keyboard stand. The stand uses a Z-shape, which makes it easy to stretch your legs underneath the keyboard without obstructions. It’s also an ideal keyboard stand for use with a pedal. The shape of the stand helps to make it more stable since it diffuses any wind that blows through the stand if you happen to find yourself performing outside in a gazebo or musical venue. Often, keyboard players have to play at outdoor weddings so a solid stand that can resist the wind is essential. The shape is also incredibly resilient and it can stand up to the most lively performance. The keyboard can be adjusted to accommodate a variety of players and keyboards. You’ll be able to adjust the keyboard to match your height so that you can play comfortably anywhere. Many other keyboard stands can only be adjusted in a limited way. This can impede a musical performance. Even more importantly, this particular stand will work with most any keyboard. 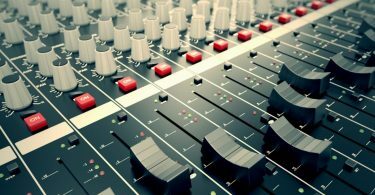 It will even work with the high-end Yamaha keyboards that typically require a special stand. The keyboard has the ability to adjust down to a 49-key keyboard and all the way up to a full-size 88-key keyboard. 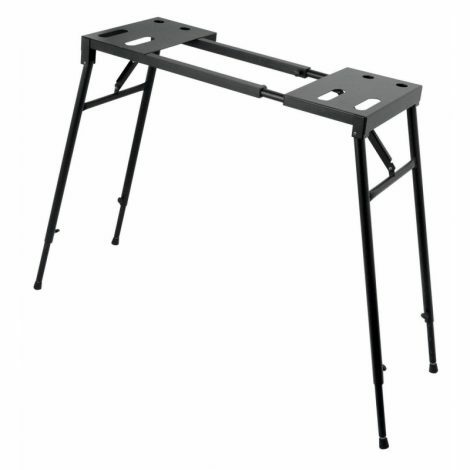 Many of the keyboard stands that are currently sold won’t work well with a typical household chair. It’s important for you to be able to grab any chair that is available if you’re a performer. Most performers don’t take their stools along with them when they go to perform, and this makes a stand that is tall enough to support a regular chair an essential component. I also especially like that the top bars tend to stick out a bit on even the largest keyboards. This makes it possible to hang items from the bars so you’ll have quick access to your most important tools. This stand is also incredibly easy to assemble. The level of sturdiness is an extremely important aspect of this piano stand. You won’t have to worry about the stand gradually descending into the ground as you play, and it will hold its position even if you’re playing the most challenging Rachmaninoff piece. A close runner up is the Gearlux. This stand is ideal for people who want a more mobile stand. It collapses easily, but it still provides a solid and stable stand. 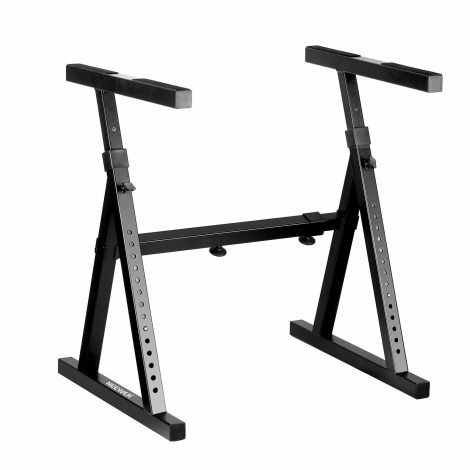 While the recommended stand will provide you with a more stable stand that will likely last longer, you may need to choose this stand if you need to travel often. 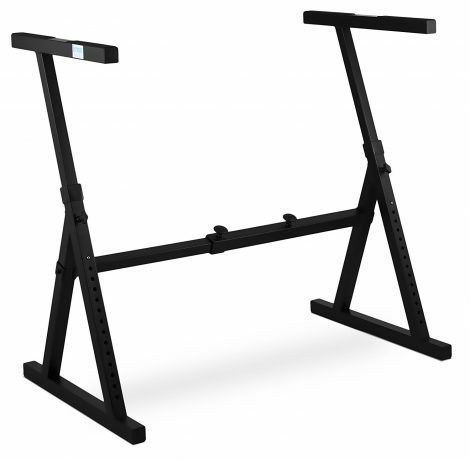 The stand can support a maximum of 110 pounds. 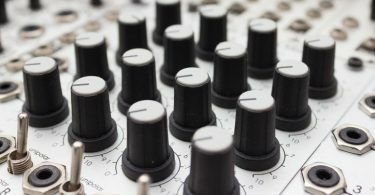 You can also use it with mixers, DJ keyboards, and other equipment. As with the top pick, this keyboard also allows plenty of room to use a pedal, and you don’t have the X-shape bar to get in your way when you’re playing. It will stand up to a heavy-handed performance, and it’s adjustable to the point where you’ll be able to use most any chair with the keyboard stand. The one con is that the stand doesn’t come with a bag. This makes it less convenient when traveling since you’ll have to be careful not to set any objects on top of the stand. The stand may scratch easily. This stand is a great stand if you need something more than a mere keyboard stand. It provides enough strength to support mixers and other heavy equipment. It’s also highly adjustable, so you can adjust it to fit most equipment. This stand doesn’t use an X design, which makes it ideal for the serious player who wants a reliable stand. You’ll be able to adjust the height, and the table leg setup ensures that the stand maintains a reliable and stable platform. Not all keyboard stands offer enough room to use a pedal without impediments to the playing. 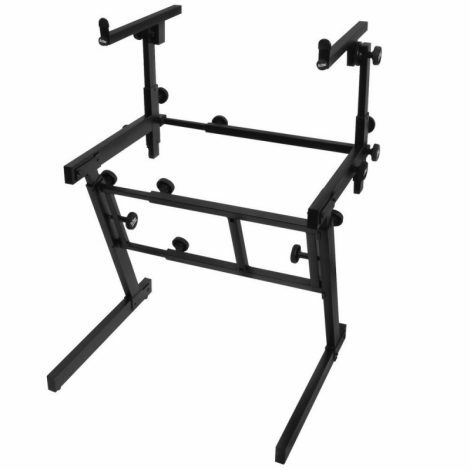 This stand does provide enough clearance to make it easy to use your pedal, and the tubing is ideally suited for any cable work that might need to be completed. The only reason this keyboard isn’t ranked more highly is because it won’t fit all keyboards. Specifically, if you have a Yamaha 88 key P-series keyboard, you should steer clear of this stand. For the cost, this stand doesn’t really provide enough features to make it worthwhile. On the positive side, it’s a very portable keyboard. The keyboard is also fully-adjustable, and it’s ideal for heavier vintage-style keyboards that might break a lesser stand. It’s a very sturdy stand that can support a keyboard of up to 230 pounds. There are very few keyboards out there that weigh this much, so this stand might be more useful for someone with a more permanent setup and an extremely heavy keyboard. The stand is made with a welded and bolted design, and it can be folded up to take with you. However, unless you have an insanely heavy keyboard, it’s not the best option for most musicians. The keyboard stand is reliable and you won’t regret purchasing the stand. However, the stand does seem a little unbalanced on some surfaces. You’ll want to be careful where you place the stand to ensure your keyboard doesn’t bounce around. If you want more than a keyboard stand, this keyboard stand comes with a second tier. You can stack two keyboards with this stand. However, this kind of setup is not used very often. If you need to bring along two keyboards for your performances, though, this keyboard could provide a suitable option. The unit does fold flat for storage purposes, and you’ll be able to make adjustments to ensure it fits your needs. The keyboard stand can support up to 400 pounds, which ensures that you won’t have to worry about the weight of any keyboard you choose to use. However, the second tier can only support a weight of 60 pounds, so make sure you put your lighter keyboard on top. It can be used for both DJ equipment and keyboards. The keyboard uses an all-welded construction, which means you’ll have a keyboard that can potentially last a lifetime. The stand height extends from 24 to 36 inches. This makes the stand useful in a variety of situations. Using a triangle design, this stand looks as good as it functions. The stand can be freely adjusted using a rounded mount. These mounts are easy to use, and you can even make adjustments during a performance if it’s necessary. The stand extends to a maximum of 35.4 inches high. It’s also long enough to make it possible to fit a variety of keyboards. The tube construction extends to 1 1/4-inch square tube construction. The square construction makes it less likely to bend, and it helps to reinforce the stand so you can focus on playing your music. There is plenty of space to add your own pedals and other accessories. The open design makes it easy to get set up quickly as well. One major disadvantage is that this stand doesn’t come with any straps to keep the keyboard in place. The top bars do contain rubber pads, but the pads aren’t enough to keep the keyboard motionless during heavy sections. Not many stands use a triangle-based structure, so the design is one of its selling points. 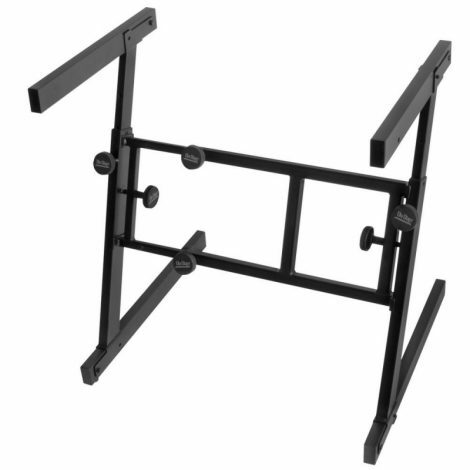 This is another Z-frame stand that allows you to perform in many different playing positions. You’ll be able to play this keyboard from any side, and you can easily place a pedal underneath. The stand can be broken down to carry with you wherever you need to travel, and the center box beam gives you extra reinforcement to ensure proper reinforcement of the keyboard. The stand also allows for independent adjustments, so you can get the exact setting for your next performance. You’ll love the fact that you’ll be able to fit even the largest keyboards on the stand. It doesn’t move around, and your keyboard will stay in place. There are no straps to keep the keyboard from moving, but the rubber top seems to do a good job of keeping the keyboard in place. 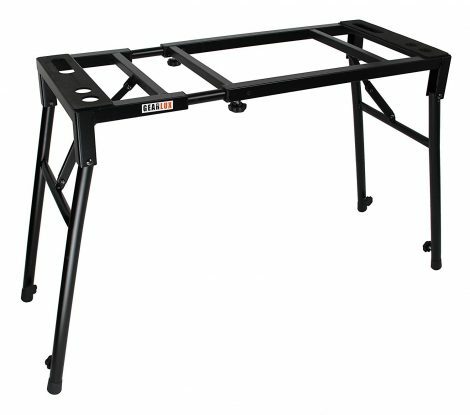 The stand does require a little bit of work to assemble, and you may want to choose another stand if you need it to collapse quickly.